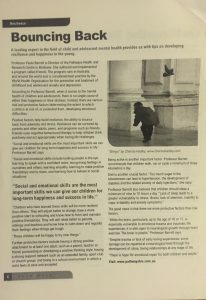 This is an article about resilience and social and emotional skills explained by Dr Paula Barrett. “A lending expert in the field of child and adolescent mental health provides us with tips on developing resilience and happiness in the young. Professor Paula Barrett (…) authored and implemented a program called Friends. The program runs in Australia and around the world and is considered best practice by the World Health Organisation for the prevention and treatment of childhood and adolescent anxiety anti depression. According to Professor Barrett, when it comes to the mental health of children and adolescents, there is no single cause of either their happiness or their distress. Instead, there are various risk and protective factors determining the extent to which a child is at risk of, or protected from, developing emotional difficulties. Positive factors help build resilience, the ability to bounce back from adversity and stress. Resilience can be nurtured by parents or other adults, peers, and programs such as Friends. Friends uses cognitive behavioural therapy to help children think positively and act appropriately when facing life challenges. 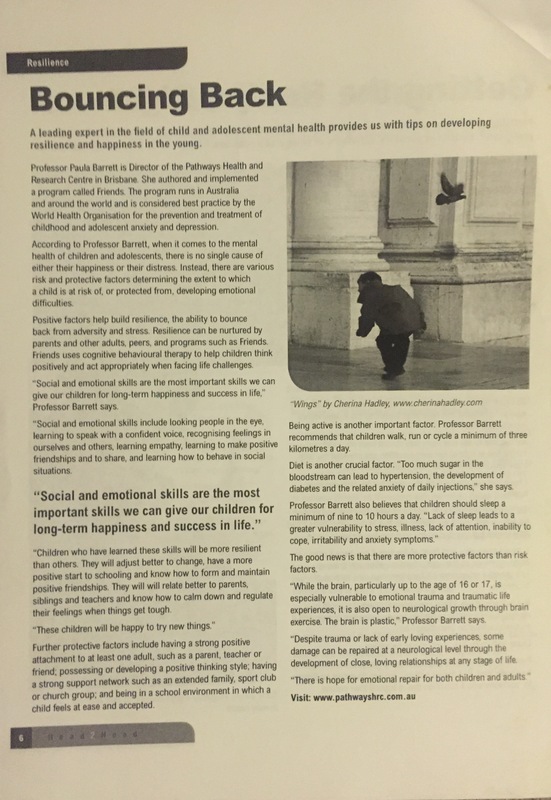 “Social and emotional skills are the most important skills we can give our children for long-term happiness and success in life,” Professor Barrett says. “Social and emotional skills include looking people in the eye, learning to speak with a confident voice, recognising feelings in ourselves and others, learning empathy, learning to make positive friendships and to share, and learning how to behave in social situations. “Children who have learned these skills will be more resilient than others. They will adjust better to change, have a more positive start to schooling and know how to form and maintain positive friendships. They will will relate better to parents, siblings and teachers and know how to calm down and regulate their feelings when things get tough. Further protective factors include having a strong positive attachment to at least one adult, such as a parent, teacher or friend; possessing or developing a positive thinking style; having a strong support network such as an extended family, sport club or church group; and being in a school environment in which a child feels at ease and accepted. Being active is another important factor. Professor Barrett recommends that children walk, run or cycle a minimum of three kilometres a day. Diet is another crucial factor. “Too much sugar in the bloodstream can lead to hypertension, the development of diabetes and the related anxiety of daily injections,” she says. The good news is that there are more protective factors than risk factors. “While the brain, particularly up to the age of 16 or 17, is especially vulnerable to emotional trauma and traumatic life experiences, it is also open to neurological growth through brain exercise. The brain is plastic,” Professor Barrett says.